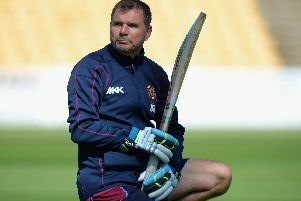 Head coach David Ripley felt Olly Stone’s three-wicket burst was crucial as Northants Steelbacks tamed Leicestershire Foxes at the County Ground. The Steelbacks had posted a below-par 244 for nine, but Stone took three wickets in his first 14 deliveries to reduced the Foxes to seven for three. It was a sticky start and one they never recovered from as the Steelbacks secured a 55-run win that kick-started their stuttering Royal London One-Day Cup campaign. And Ripley was quick to praised 21-year-old Stone, who has made an impact in all three formats so far this season. “We hope that kick starts us a little bit,” said Ripley, who saw his side lose their first two games in the competition. “We haven’t played well so far but we played much better tonight and got a win. “The next game comes (at Derbyshire) on Friday so they come thick and fast but we’re obviously pleased to get off the mark. “We felt we were about 30 short but we came out with a lot of fire tonight. “Olly Stone and Rory [Kleinveldt] as a collective were very good up front, which is something we’ve missed in our other games. “The boys fielded well and I just had a good feeling when we’d taken those early wickets that we’d win. “Olly is a great competitor in all formats, he scored some important runs as well (Stone hit an unbeaten 19 in the Steelbacks innings), caught a slip catch and he’s a top young player. “He’s a very mature young fellow as well and we’re delighted we’ve got him, he certainly contributed massively to that win tonight. While the Steelbacks’ total of 244 for nine eventually proved plenty, Ripley admitted he was disappointed that his side had not posted more. They were 176 for three at one stage after Josh Cobb’s 86, alongside Rob Keogh’s 50. Following collapses in their opening two games, they lost six wickets for 43 runs, and only a last-wicket stand of 25 between Stone and Graeme White got them to their final score. “It’s disappointing as the first part of that repair job was done very well,” Ripley said. “Ben [Duckett] and Josh and then Josh and Rob Keogh played very well and it was all set up nicely, we were thinking about 280 from that platform but it didn’t work. “Those two got out, they got on a roll and no-one could get a partnership going after that, so we were indebted to Olly getting those few at the end just to give us a little bit more belief we could defend it.